Consumer Reports Food Safety and Sustainability Center released its “Beef Report” on August 25. A number of questions, concerns and criticisms have been raised by the North American Meat Institute, the International Food Information Council, Business Insider, and others. Rather than answer the specific questions raised, Consumer Reports has encouraged people to read the report more closely. Unfortunately, reading the report more closely simply raises more questions about the expertise and/or integrity of Consumer Reports and its “policy and action arm,” Consumers Union. “The Danger of Superbugs” heads a section on Page 10 and 11 detailing the health hazards posed by Shiga-toxin producing E. coli (STECs, like E. coli O157). This directly implies that antimicrobial resistance will make STEC infections more difficult to treat. This is not true. Is Creep Feeding an Answer to Your Pasture Woes? This article written by Dr. John McKinnon, University of Saskatchewan beef cattle nutrition researcher and professor, originally appeared in the August 2015 issue of Canadian Cattlemen magazine and is reprinted on the BCRC Blog with permission of the publisher. As this summer unfolds, drought has reared its head across much of western Saskatchewan and Alberta. As a result many producers are scrambling to find alternative pasture and hay supplies and soon will be looking for alternatives to traditional winter-feeding programs. When the quantity and quality of pasture starts to decline due to drought stress, there are several management steps that producers can take to decrease grazing pressure. Two of these involve creep feeding and early weaning. The concept of early weaning has been addressed in a separate article in this issue by Dr. Reynold Bergen. This article will focus on creep feeding and its potential to increase calf performance and reduce grazing pressure. This article written by Dr. Reynold Bergen, BCRC Science Director, originally appeared in the August 2015 issue of Canadian Cattlemen magazine and is reprinted on the BCRC Blog with permission of the publisher. Winter feed will be a scarce and costly resource in much of Western Canada this year. Use it carefully, because the management decisions you make now will impact reproductive and economic performance for at least two years. Cattle and other ruminants are able to digest grasses and other fibrous material because of the billions of bacteria, fungi and protozoa in the rumen. Each of these microbes has a preferred food source. For example, some prefer fibrous materials, whereas others prefer starch. Regardless of their preferred feed source, all bacteria beak down simple sugars to volatile fatty acids such as acetate, propionate, and butyrate. These volatile fatty acids are absorbed through the rumen wall into the bloodstream and provide an important energy source for cattle. As their names suggest, volatile fatty acids are acidic under normal pH conditions in the rumen. 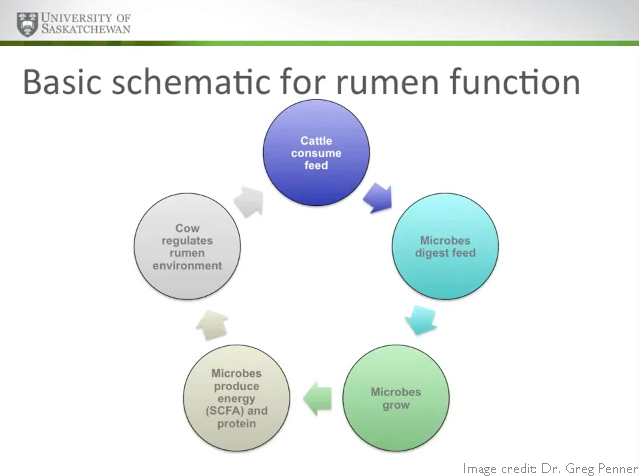 As a result, rumen pH varies with volatile fatty acid concentrations in the rumen. Rumen pH drops as feed is digested rapidly, and rises when the rate of digestion slows. Normally, the production and utilization of volatile fatty acids is in balance. Ruminal acidosis occurs when acid is produced faster than it can be utilized. Ruminal acidosis is a digestive disorder that is characterized by low rumen pH (more acidic than normal). Typically acidosis is said to be a pH below 5.8 (normal rumen pH is 6.5 – 7.0). Cattle are at greatest risk for acidosis when consuming feed that is high in fermentable carbohydrates, which is most commonly associated with feedlot rations but can also happen on high quality pasture. Cattle that go off feed for an extended period of time are also at risk when they resume feed intake. Click to continue reading… more information on the types, causes and prevention strategies of ruminal acidosis in beef cattle. Feed efficiency is one of the most economically important traits in beef cattle production. However, genetic improvements in feed efficiency have been limited and slow, primarily because measuring the actual feed intake of individual animals is extremely labor intensive, time consuming and expensive. A better understanding of how various physiological and metabolic processes influence feed efficiency is important to developing inexpensive, rapid methods of reliably predicting feed intake. Genetic relationships between efficiency and other economically important traits such as health and reproductive performance are also relatively unknown.